Does technology connect us? Or does it push us further apart? That’s a question that Mandurah’s youth performing arts company Riptide will be asking in The 1’s the 0’s and Everything in Between. Nina Levy caught up with artistic director Katt Osborne, to learn more about this timely new work. Recently I deleted the Facebook app on my phone. Although the moment of deletion was impulsive (close to midnight, mid-scroll), for some months prior I had been concerned about both the amount of time I was spending on the app, and the fact that the ratio of enjoyment to anxiety experienced whilst “using” seemed to be tipping in favour of the latter. In theory, I’d like to delete my social media accounts altogether… but there’s no way I will. Facebook, in particular, is central to both my professional and social life. I’m not alone in this, nor in experiencing newsfeed-induced anxiety. Social media is a double-edged sword. 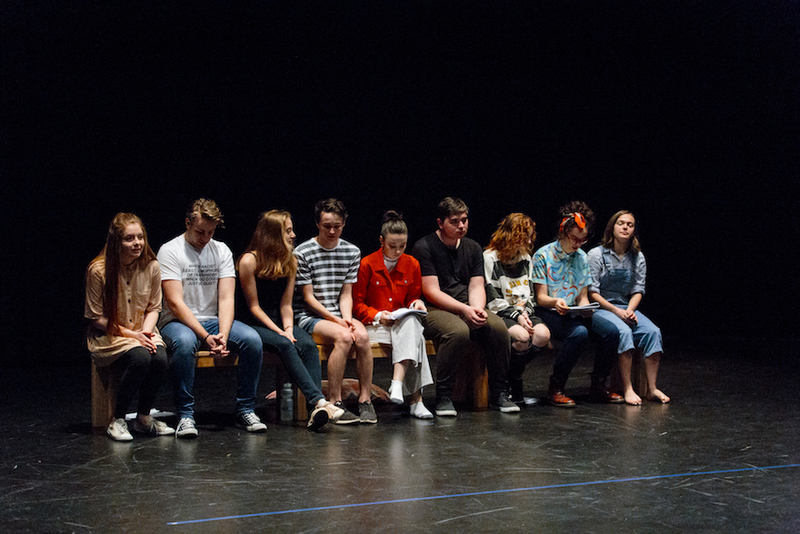 It’s this paradox that is at the centre of The 1’s, the 0’s, and Everything in Between, a new play from Mandurah Performing Arts Centre’s youth company Riptide, that’s been co-commissioned with The Australian Theatre for Young People. Written by local playwright Chris Isaacs and directed by the company’s artistic director Katt Osborne, the work explores the effects of digital communication and conversation on our relationships. “1’s and 0’s is a play about connection and disconnection through the use of technology,” explains Osborne. “But it’s not about technology, it’s more about ways humans communicate and seek those connections, and how that has changed over time; and how the internet and devices can bring us closer together, but maybe sometimes that doesn’t make us feel close, and what that means for human relationships. ‘The script is very open and that’s been exciting for me, as director, and for the performers, because we have a lot of room to make it into what we want.’ Katt Osborne (right), rehearsing with Riptide company members Monique Tibbott and Harrison Mitchell. Photo: Jamie Breen. ‘The aim of the company is to grow and empower young artists … to grow their skills and be exposed to more professional work and … to make their own work.’ Pictured: Riptide company members in rehearsal. Photo: Jamie Breen. Those who are familiar with Katt Osborne will know that she has a diverse background in theatre as a maker, director and creative producer. After graduating with a Bachelor of Contemporary Performance from Edith Cowan University in 2007 she founded an independent company called The Duckhouse, which presented work at Perth venues such as The Blue Room Theatre and PICA. After five years that company morphed into The Last Great Hunt, and Osborn became both a core artist of the company and its general manager for three years. She has also worked in opera as a director, and last year worked in the UK as assistant director for Dr Seuss’s The Lorax, at The Old Vic. 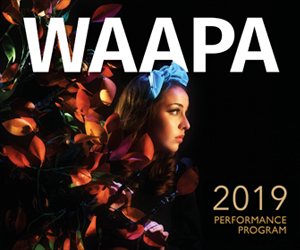 In addition to directing Riptide, currently she is a Black Swan State Theatre Company Resident artist, and is producing Actéon for West Australian based opera company Lost and Found. The 1’s, the 0’s, and Everything in Between plays Mandurah Performing Arts Centre, 19-23 September. 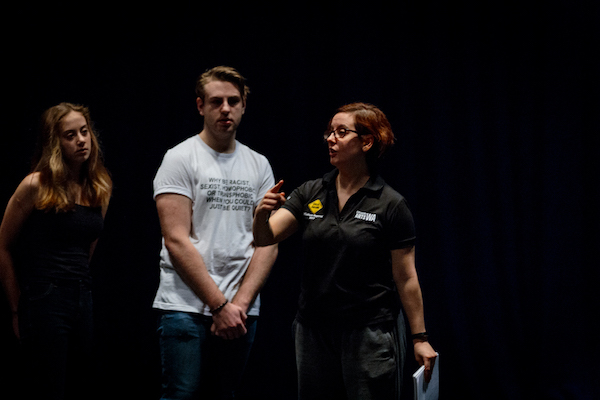 Pictured top: Teaghan Lowry (centre) with Harrison Mitchell and Tristen Pateman, rehearsing “The 1’s, the 0’s and Everything in Between”. Photo: Jamie Breen.